How do I create a custom style for positioning views in reinforcement drawings ? For complex projects , the reinforcement drawings have to be as complete and detailed as possible.For this reason, the Advance Concrete user is given the possibility to decide upon the necessary number of views and to create a personal style for the arragement of these in a reinforcement drawing. These settings can be saved and used as often as needed, by creating a custom template. In Advance Concrete there is a set of such templates, which can be modified and to which, new ones can be added. 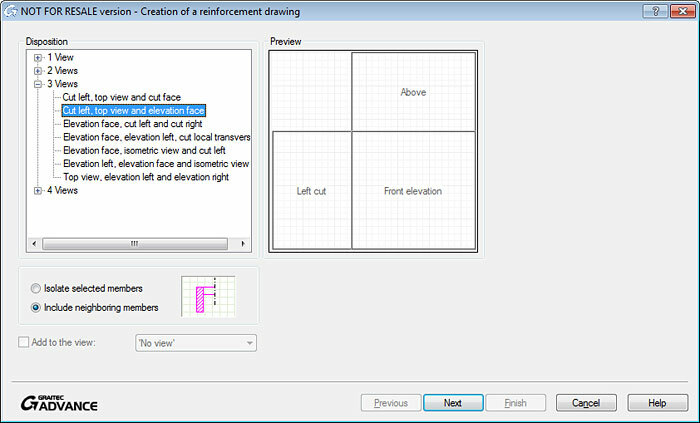 In the Advance Reinforcement toolbar, click the button to display the first dialogue window of the reinforcement drawing creation assistant. For each of the templates, the name is preceded by the '#' symbol and the dimension of the area assigned to each view is defined in percents. 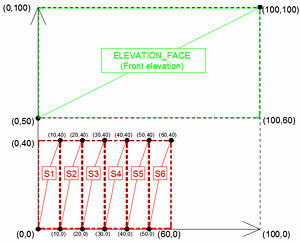 For each view, its surface can be pictured as an imaginary rectangle; the coordinates of the extremity points of this rectangle's diagonal are the percent values defined in the template. The sum of all these surfaces is actually a square, whose diagonal extremity points have the following coordinates: (0,0) and (100,100). The user can create a custom template, where he/she can choose the necessary number of views and their positions on the plan. 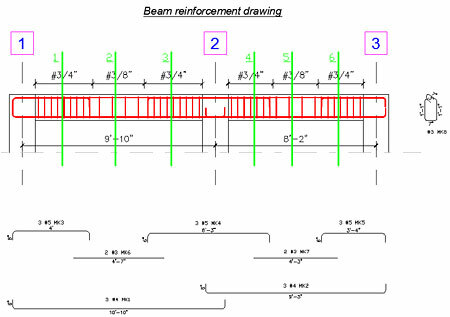 In the example below, it is required to create a reinforcement drawing for a beam with 2 unequal spans which should contain an elevation and as many sections as needed to have a complete picture on the reinforcement of the beam. 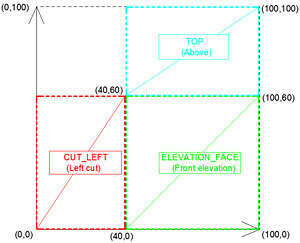 The suggested template should contain a face elevation and 6 section cuts. After all the data has been introduced, the text file is saved and in Advance Concrete, at pressing the button, the user's template is available for selection, in the template list. 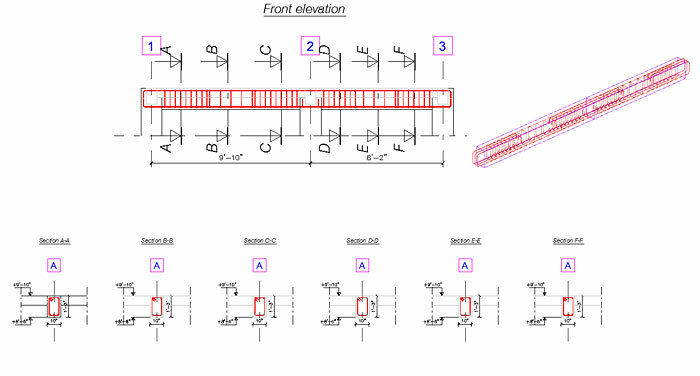 To create a reinforcement drawing for a 2-span beam, the user must select the elements from 'Model', then use the button, and, in the open window, selection of the newly created template is required, followed by pressing the 'Next' button. 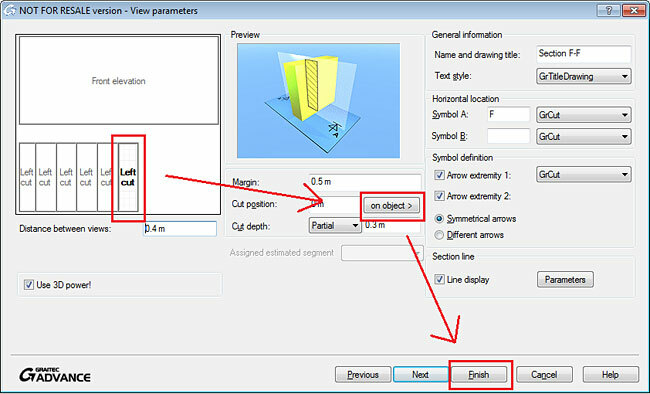 In the 'View parameters' window, to position the section cuts, select each section view and pres the 'on object' button. This automatically leads to the drawing, where the user has to click on the beam, on the desired position of the section. 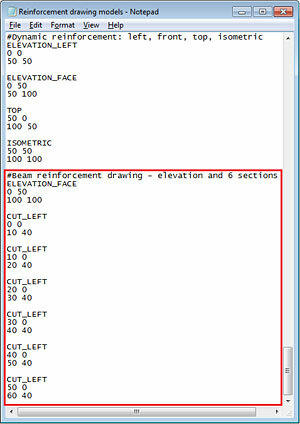 After placing all the section cuts, the user either uses 'Next' button to continue to set other features of the drawing, either he/she chooses the 'Finish' button to directly create the reinforcement drawing. 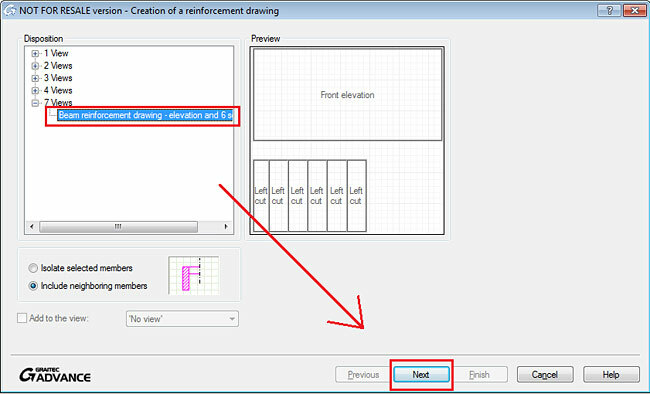 If the user wishes to change the position of a certain section view, the 'Properties' window can be accessed by using right-click on the name of the drawing in 'Drawing' mode. 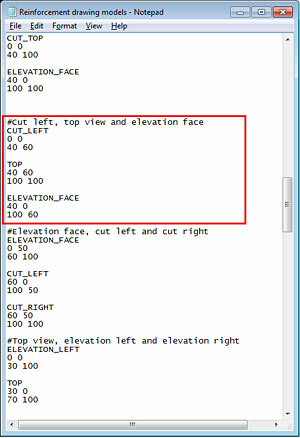 Here, in the 'View parameters' category, the steps to be followed are the same as the ones presented above.